Stir fry for me is a mid week fail safe. 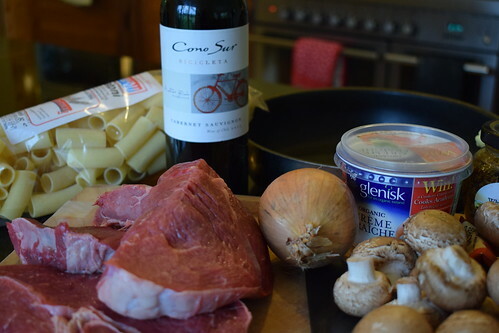 Put the beef in a bowl and toss in the cornflour and paprika. 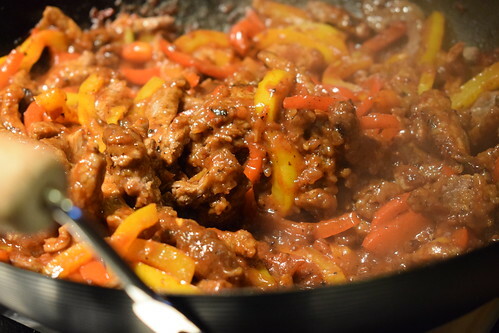 Heat the oil in a wok or large frying pan until hot, then add the beef and fry until golden and very crisp. Scoop out the beef and drain on kitchen paper. Pour away all but 1 tablespoon oil. Add the peppers, half the chilli, the white ends of the spring onions, garlic and ginger to the pan. 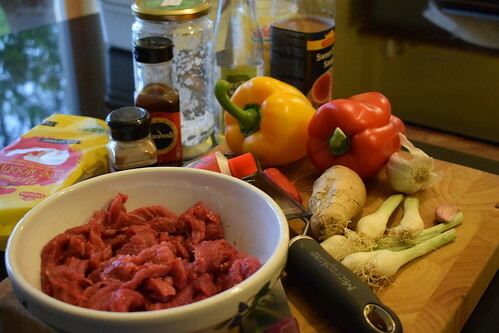 Stir-fry for 3 mins to soften, but don’t let the garlic and ginger burn. Mix the vinegar, soy, chilli sauce and ketchup in a jug with 1 tablespoon water, then pour over the veg. Bubble for 2 mins, then add the beef back to the pan and toss well to coat. 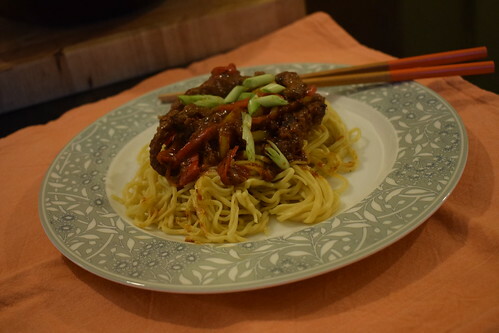 Serve the beef on noodles, if you like, the green parts of the spring onions. Sometimes we crave a little simplicity. 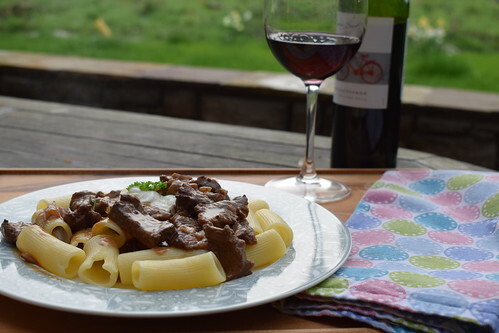 This recipe can be used as a prelude to a banquet, or a quiet meal for two. The tuna can be changed into slow poached chicken breast, or good quality striploin steak. But for a little bit of healthiness on a weekday- fish it is. Tuna Steak is about as far removed from the old style tinned tuna that your grandmother used for sandwiches with some sandwich spread- (remember THAT!) as the original ford motorcar is from a Ferrari. Some species of tuna are now verging on extinction- the opening day fish auctions at one of Tokyo’s fish market have seen record-setting prices for bluefin tuna, reflecting market demand. In each of 2010, 2011, 2012 and 2013, new record prices have been set for a single fish – the current record is 155.4 million japanese yen (US $1.76 million) for a 221 kg fish. Wowsers. Due to changing fishing practices, catching tuna is more friendly to other species, most notably dolphins, who are found with them in their natural habitat. 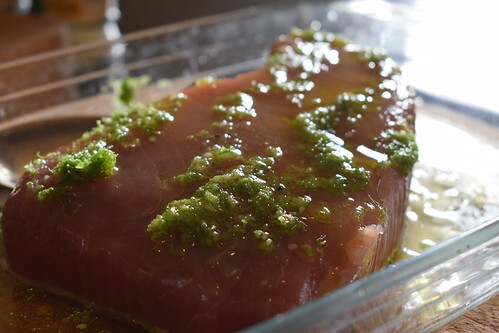 Marinate the tuna steak by placing it into a large bowl and adding the lime zest, cracked black pepper, about ½ teaspoon salt, the ground cumin, the pinch of cayenne pepper, about 1 tablespoon of the olive oil, the lime juice and the 1 clove of pressed garlic. Rub the marinade into the fish and allow it to sit for about 20 minutes. Drizzle the bread lightly with some olive oil. Sprinkle over a pinch of salt and black pepper and toast the slices in a hot oven until golden brown. Next, rub the whole garlic clove over each slice of the toasted baguette to gently perfume it; set the slices aside for a moment. 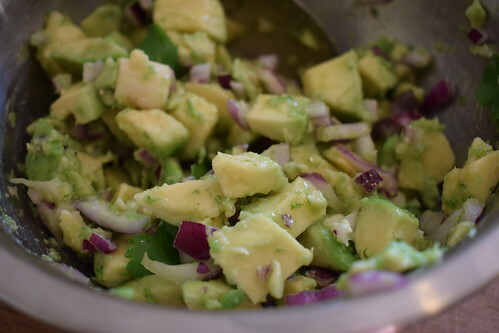 Prepare the Avocado-Lime Salsa, cover and put in the fridge until ready to serve over the crostini. Grill the steaks by placing a large griddle pan over high heat; once the pan is very hot, (smoking) add a drizzle of olive oil to it, add the tuna. Grill the steak for about 1 minutes on the first side and about 1 minutes on the second side, and allow it to stand for about 10 minutes before slicing. 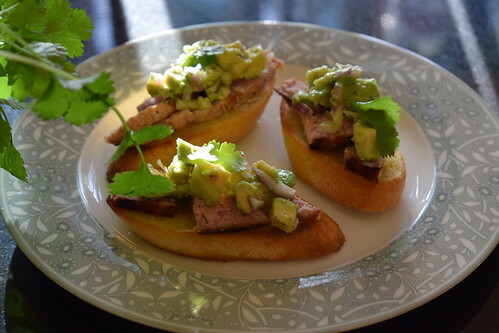 To assemble, add several thin slices of the grilled fish steak to each charred crostini, then top with a spoonful of the Avocado-Lime Salsa, sprinkle with an additional twist of fresh cracked black pepper and salt. 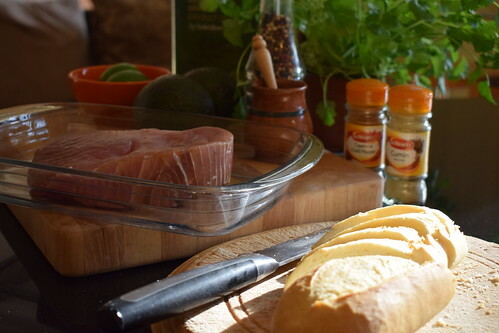 Place all ingredients including the lime zest into a bowl, and drizzle with about 1 tablespoon of olive oil, with a few pinches of salt and pepper; gently fold the ingredients together, cover and refrigerate until ready to use. Twitter is really the best place to get restaurant recommendations. And they are instant. They probably exclude those establishments that don’t have a twitter presence. But that’s their problem. We were looking for recommendations for eating in Lisburn. We were already heading to the new Uluru premises in Armagh, as we have been tweeting with Dean for quite some time through #SundayCookOff, and really enjoyed our meal there the last time. He couldn’t recommend Stevie in the Square Bistro highly enough, as did other tweeps, so we booked a table. As usual after running around mountains all day orienteering we were well and truly famished by the time we arrived. So starters were a definite. My feta cheese fritters with honey and truffle was delicate but each flavour was there, and the sweetness of the cheese was very good with the honey. Due to the carnivore nature of our family, 3 out of 4 of us had steaks. Nigel had the special, I had the flat iron, and Jordan the rib. Robert had the duck, which was tender and nicely spiced. …as requested. You’ve no idea how often it doesn’t come out that way. The chocolate quality must have been good as the taste was so smooth. Mind you, Robert’s sticky toffee pudding also looked like a winner. This is a perfect place to go for an intimate bustling atmosphere, that ecshews the normal burger/ steak joint format. A room full of tarts..
As Dame Edna put it so beautifully on the Great British Bake off for Comic Relief last week, today we had a room full of tarts. And then some. I did a little sneaky practice yesterday and made the Normandy Pear Tart. Today, however it was the turn of the Apricot and Frangipane tart. I am a fan of these tarts (quelle surprise you might say), and really enjoyed putting it together. And I think I might even put a tart on my final exam menu. Of course it would be foolish to take such a bold step without practicing them all again. We also showcased smoked fish today as a starter, and I was particularly happy with my presentation of one of my plates. The finished product: A plate of smoked fish. I particularly liked the smoked trout. The intense flavour married very well with the more subtle smoked tuna. We had sirloin for our main course, and the teachers emphasized how expensive good cuts of beef are, and also what to look out for when buying steak. I remember when in Kevin Thornton’s restaurant in Dublin, while filming Heat! how he showed us how to trim the fillets so carefully, and to really take your time trimming the meat. Sirloin Steak, with french fired onions and wild garlic leaves. So we ate quite well today, considering it was a Monday. I even managed to squeeze in a taste of Gran Marnier Souffle, which was completely devine. And I mean that, even after tasting all the tarts.